NAT. is an Australian skincare brand that carries various skincare items as well as the aroma therapeutic and rosehip products. 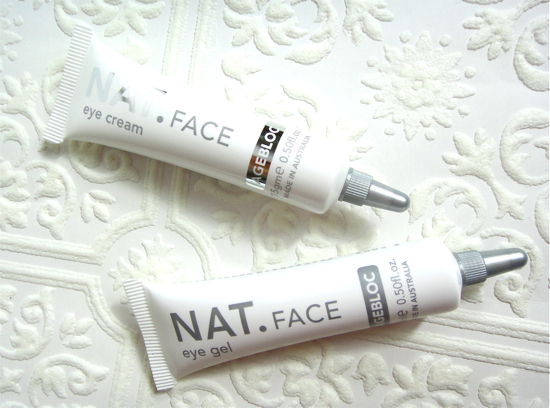 Agebloc is their eye care range features the ingredient called "IBR Snowflake" that is supposedly a "botox alternative". I was generously offered to try both Gel and Cream. These are sold separately but also come in a set with a cute pouch which is very well made and sturdy so I'd actually use it, by the way. The packaging is nothing fancy but clean and practical. 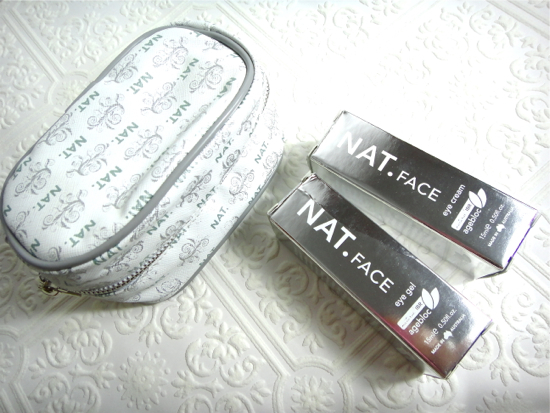 Each contains 15 ml that would last me for a long time since I only need just a small amount for each application. The Eye Gel is for the day time use. NAT. Eye gel soothes and calms puffiness and dark circles thanks to the natural cucumber, chamomile, pansy and lime blossom extracts. Natural AHA’s along with powerful IBR SNOWFLAKE gently shed dead skin cells minimising fine lines and wrinkles. This gel is clear and has no particular odor. It is very light in texture and absorbs in nicely. My eye area feels moisturized but not overly so that my sunscreen or makeup slides off or anything. Whenever I use this gel, it feels slightly warmer and almost tingly. It is not the kind of discomfort or irritation, though. The Eye Cream is meant for the nighttime use. NAT. Eye cream is the latest in antiaging “botox alternative” treatments. Rich in a newly discovered and botanically derived skincare ingredient called ‘IBR Snowflake’ from the dormant bulbs of the Summer Snowflake plant. This botox-like ingredient has been shown in clinical trials to effectively inhibit muscle contractions therefore helping to reduce the appearance of fine lines and wrinkles. It also has the ability to naturally slow down cell proliferation and therefore help promote a younger, healthier looking eye area. 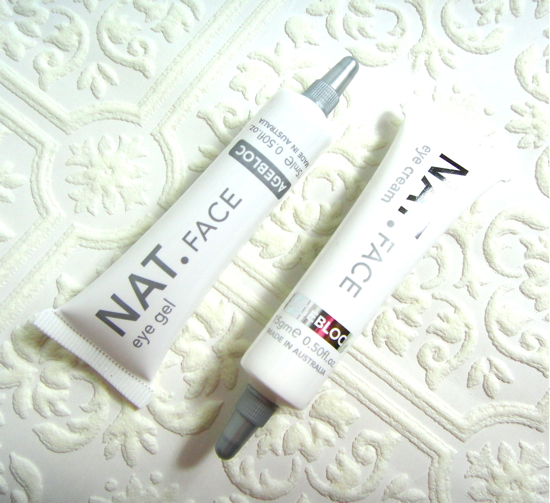 The Eye Cream is quite light in texture as well. I find the cream is emollient enough especially for its light airy texture. I like that it contains a low dosage of AHA which is an old school ingredient that has been working for me very well. You definitely want to avoid too much acid around your eyes, but when used right, AHA helps to gently exfoliate and retain more moisture. Unlike some of the heavy cream, it does not cause any milia and I think my eyes look fresh and well-rested in the morning. Being a disbeliever, at first I did not think it was the eye cream that made my eyelids look plump and more awake. I thought it was the salty instant ramen noodle soup that I ate the night before. LOL. Now I am seeing the positive effects more consistently, so maybe it is the cream (and/or the gel)? Have I seen the miracle? No, but it has been only a few weeks since I started using them, and maybe it is unfair to judge an eye treatment after such a short period time. What is more important is that the quiet yet positive result is clearly there for me to see, which has made me want to keep incorporating these in my current skincare regimen. This post contains PR samples provided for editorial consideration.